Among books that discern people's reason for living, this one is exceptional for its interfaith perspective and clear text readily accessible to people of all backgrounds. Reverend Poos-Benson mines the wisdom of the great spiritual heroes -- Jesus, Buddha, Krishna, Mohammed, Lao Tzu -- to reveal a pattern in how God works in the world. He believes that God has sent us to fulfill a unique destiny; in order to find meaning in life, we must understand why we have been sent and then fulfill that purpose. Having been one of the first responders after the Columbine school shootings, he is well qualified for his focus on the thorny issue of great trauma, empowering readers to become aware of how the divine is moving through their lives in spite of tremendous suffering and evil. He also provides questions for individuals and groups to ponder, resulting in a vibrant text that leads to healing and self-transformation. In April 1999, Steve was at the center of a watershed moment in U.S. history -- the shootings at Columbine High School. He was a first responder to the scene. Stephen worked with families whose children had been killed or wounded. He also ministered to the family of one of the shooters. As a part of his work, he was interviewed by Time to assess the progress of healing in the community. He addressed the nation twice as a part of the five- and 10-year anniversary ceremonies. He maintains an active blog at StevesCowboyJesus.blogspot.com. "To everyone who has ever been called, but can't discern the message--read this book. To everyone who feels compelled to journey on, but can't find the map--read this book. Stephen Poos-Benson has been there. He knows what he is talking about. He has been sent to bring you Sent to Soar! Read it. "Sent to Soar is a creative, honest, humorous, and challenging pathway to deep personal and spiritual transformation. The Rev. Dr. Poos-Benson brings his years of experience with real life and real people face to face with a complex array of ancient and contemporary faith perspectives. This book is a breath of fresh air in an atmosphere often choking from religious ego and easy answers. Read Sent to Soar and risk divine intervention! "I had been a member of Rev. Poos-Benson's Columbine United Church for six years before the Columbine shootings. Immediately after the tragedy Steve, the CUC congregation and our nearby rehabilitation hospital became close partners. We were wounded communities within a wounded community, doing the best we could. Together we established a temporary crisis center at Craig, and for months worked to rehab and heal the catastrophically injured and their families, and ourselves at the same time. 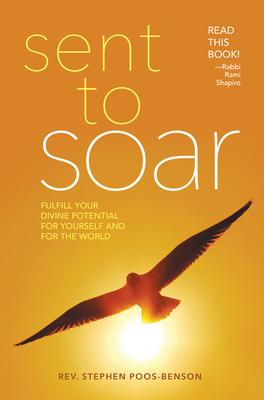 Sent to Soar is an insightful and helpful book. I highly recommend it. "In a world of lost souls looking for some purpose beyond earning a few more dollars, Sent to Soar invites us to claim a larger perspective. It's not just about me but us! Steve gives us a wakeup call written in a compelling style that encompasses the world's great religions to get the reader in touch with deep possibilities waiting to be unleashed. Read this book and expect transformation.